We are extremely excited to see how fast our customer base extends and have decided to make it a priority to upgrade our support infrastructure as soon as possible. In addition to quick response, we wanted to offer a new, simpler ways of extending Cloudinary's combined knowledge base, offering a place where our community can quickly find answers to burning questions, a location where you can share your Cloudinary experience and best practices for the whole community to enjoy. Without further ado, we're happy to announce our newest addition to Cloudinary - our new support portal. While brand new, we hope that our knowledge base will grow to give answers to many of your most urgent questions. Our knowledge base is detailed and broken down into topics, for easy browsing. There is also a quick search option to simplify the browsing even further. The knowledge base should cover anything from image uploading and transformations, client libraries and how to integrate with them, plans, billing and security to name a few. So far, we have done our best to punch in all the questions and answers that we have seen come up often, with easy to use solutions and explanations. These Q&A's always have room for improvement. For each question and answer there is an option to comment, ask a follow up question or clarification. If you can't find your answer in our knowledge base, just contact our support team. For any technical issues and queries you run into, large or small, we'll do our best to offer a quick advice. Don't like forms? 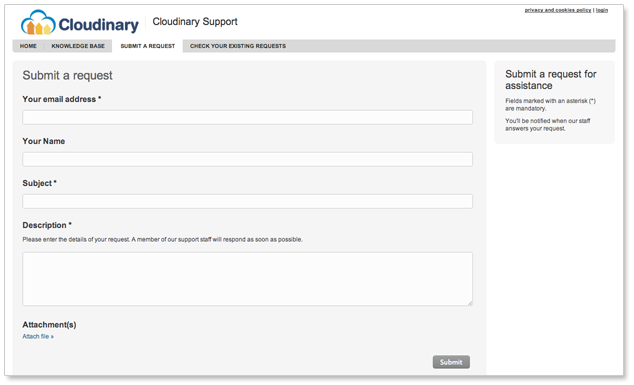 Just email us at support@cloudinary.com, it reaches the same ticketing system, only without the dropdown & fill-in form. Do you prefer a more personal question & answer session? Just click the small Contact Us button at the bottom-right of your cloudinary.com browser window. If we're there, we'll be happy to chat, and if not - just leave a message and we'll get back to you asap. Do you have a feature request? Cloudinary usage tips & tricks you can share? Best practices and recommendations? Please head to our community forums and share your Cloudinary thoughts with the rest our community. This way everyone will be able to enjoy your insights! Contemplating between different possible usage scenarios? Have burning questions you want to share with other developers like you? 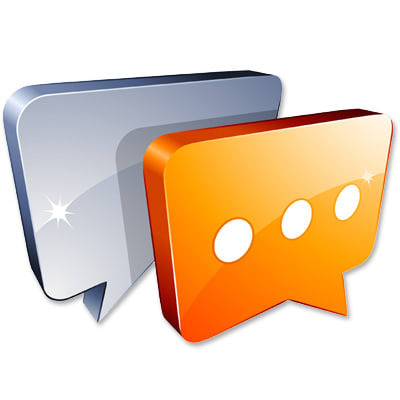 In our community forums you can share your thoughts with others just like you. Cloudinary's support team is also very active on other technical forums throughout the web. Any Cloudinary related question asked on Stack Overflow should get a quick answer, and we constantly monitor GitHub requests for anything related to Cloudinary's various open-source client integration libraries. Prefer social networking? We are always active on Twitter and Facebook, offering support and occasional tips and waiting to hear your feedback close and personal. We are doing our best to make Cloudinary as simple and as effective to use as we possibly can. In time, we hope that our new support infrastructure will be a place that can both improve your Cloudinary experience and at the same time help us understand what's important to you, allowing us to continue building the best cloud-based image storage, management, manipulation and delivery platform available. Let us know what you think - does the knowledge base answers your questions? Do you find our ticketing system easier to work with? Can our community forums offer solid advice? We would love to get your feedback!